^ Fathi Namouni and Maria Helena Moreira Morais (May 2, 2018). "An interstellar origin for Jupiter's retrograde co-orbital asteroid". Monthly Notices of the Royal Astronomical Society. 477 (1): L117–L121. arXiv:1805.09013. Bibcode:2018MNRAS.477L.117N. doi:10.1093/mnrasl/sly057. For criticism of this idea see Billings, Lee (21 May 2018). "Astronomers Spot Potential "Interstellar" Asteroid Orbiting Backward around the Sun". Scientific American. Retrieved 1 June 2018. ^ Chaing, Eugene; Lithwick, Y.; Murray-Clay, R.; Buie, M.; Grundy, W.; Holman, M. (2007). Reipurth, B.; Jewitt, D.; Keil, K. (eds.). "A Brief History of Transneptunian Space". Protostars and Planets V. University of Arizona Press, Tucson: 895–911. arXiv:astro-ph/0601654. Bibcode:2007prpl.conf..895C. ^ C. de la Fuente Marcos; R. de la Fuente Marcos (2014). 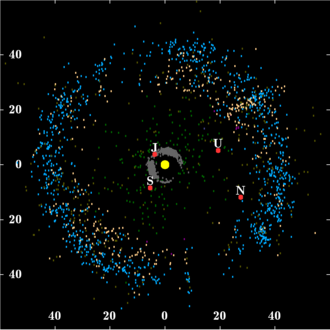 "Large retrograde Centaurs: visitors from the Oort cloud?". Astrophysics and Space Science. 352/2 (2): 409–419. arXiv:1406.1450. doi:10.1007/s10509-014-1993-9.